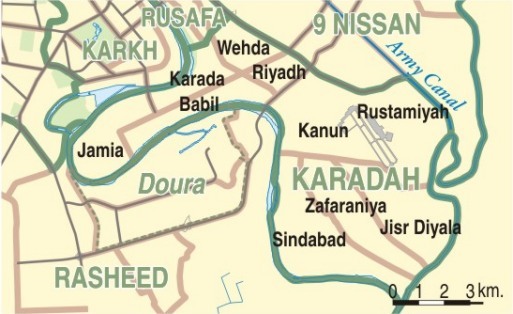 The Karadah security district is located in central Baghdad, on the southeastern bank of the Tigris River. To the north and northeast, Karadah neighbors the districts of Rusafa and 9 Nissan, respectively. Opposite the Tigris, the Karadah peninsula neighbors the Karkh district to the north and the Rasheed district to the south. The population of the Karadah district has shifted since 2003; while some pockets of Karadah are more mixed than others, a majority of the district is Shi’a. The Karadah security district can, in essence, be divided into two areas—the Karadah peninsula and the southeastern neighborhoods. The Karadah peninsula is made up of the Karadah, Babil, and Jamia neighborhoods. Prior to 2003, the neighborhood of Karadah and its surrounding areas on the peninsula were home to many of the Sunni elite; now, however, these areas are occupied by the ruling Shi’a elite. The influence of Muqtada al-Sadr and his Jaysh al-Mahdi militia is more limited in this area, as the peninsula has been a stronghold for Islamic Supreme Council of Iraq (ISCI), a rival Shi’a party. The Karadah peninsula has also been one of the calmest areas of Baghdad. The Jaysh al-Mahdi and other Shi’a criminal elements operate more widely in the southeastern neighborhoods of the Karadah security district, often collectively referred to as Zafaraniyah. The neighborhoods of Wehda, Riyadh, Zafaraniyah, Jisr Diyala, Sindabad, Kanun, and Rustamiyah comprise this area. The population demographics of southeastern Karadah have dramatically shifted in recent years. Many Sunnis living in the area were victims of forced displacement or sectarian violence at the hands of the Jaysh al-Mahdi. At the same time, scores of Shiites have fled from Sunni-dominated areas of western Baghdad to the Zafaraniyah area. According to some estimates, from late 2006 until June 2007, as many as 4,000 families resettled in Zafaraniyah.1 The large Shi’a population of the Zafaraniyah area was the target of numerous car bomb attacks by al-Qaeda in Iraq (AQI) in 2006 and 2007. From 2007-2009, Coalition clearing operations under Fardh al-Qanoon diminished the presence of al-Qaeda in Baghdad. The degradation of AQI networks in the areas neighboring Karadah—particularly in Rusafa, Karkh, and Doura—helped reduce number of spectacular attacks on Shi’a citizens in Karadah. Continued operations by U.S. and Iraqi forces have also helped improve security in the district by targeting the Jaysh al-Mahdi and other criminal militia elements in Karadah. 1 Zeke Minaya, “Iraqi Districts Struggle to Accommodate,” Stars and Stripes, June 10, 2007.